Come check this out. Fun times. at the new Bike Oven location! 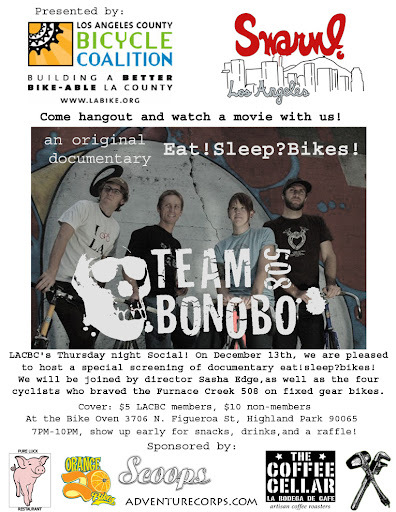 Special LACBC screening! We will be joined by director Sasha Edge, as well as the four cyclists who braved the Furnace Creek 508 on fixed gear bikes. Membership deal: Join tonight for just $30, and get in FREE! Brought to you by Swarm!, Scoops, Orange 20 Bikes, Coffee Cellar, and Pure Luck Restaurant. Beer generously donated by New Belgium Brewing! Screening at 8pm, but come early for food, coffee and ice cream (vegan too! ).